Steve Delaney created Count Arthur Strong – an elderly, pompous and easily distracted actor from Doncaster – when he was a drama student at Central School of Speech and Drama in London in the 1980s. He was revived on the comedy circuit in the late 1990s, with a number of Edinburgh Fringe appearances. Count Arthur Strong's Radio Show! ran on Radio 4 from 2005 to 2012, and was reimagined for the BBC Two sitcom Count Arthur Strong, co-written by Graham Linehan, which first aired in July 2013. 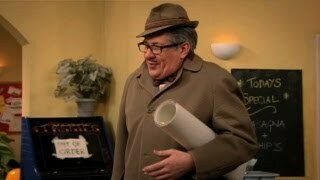 Count Arthur Strong: The Musical? We do not currently hold contact details for Count Arthur Strong's agent. If you are a comic or agent wanting your details to appear on Chortle, click here.